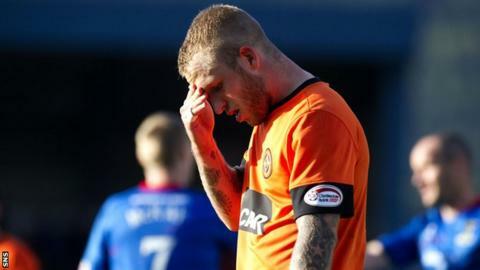 Peter Houston admits to concern about Dundee United's lack of fight after they slumped to a 4-0 defeat away to Inverness Caledonian Thistle. It was the fourth Scottish Premier League game in a row in which United have failed to score. "It is more worrying for me the way we capitulate when we lose a goal and I feel that players are lacking in confidence," the manager said. "But we've not a lot of options as we've got a small squad." Houston revealed earlier in the week that he had not yet been offered a new contract beyond next summer. "I would not be expecting the board to be giving me a contract on the back of the results over the last couple of weeks," he told BBC Scotland. Houston pointed out that United's poor start to last season "caused a bit of a stir" but admitted it was more worrying this season. "Last year, we took 10 points in the first quarter and we are sitting on eight just now, which isn't good enough," said the manager. "Huge disappointment and no excuses and I feel sorry for the United fans who travelled from distance to come up here. "I think we gave the impetus to Inverness and they were hungrier around the park. "They had more desire than us and that's what we'll be questioning and working on." United had chances themselves before Richie Foran gave Caley Thistle the lead after half an hour with the first of his two goals. "For the first 30 minutes, we started the game much the better team," he said. "We looked dangerous going forward without really testing the goalkeeper. "I think Jon Daly tested the goalkeeper from a corner, but we didn't contest the second ball. "But we gave the ball away cheaply for the first goal and it was a top-notch finish. "Instead of trying to continue to play the way we started the game, we went into our shell and, in the second half, we were really poor and it's worrying."